Our coop was built without buying any new material. We used recycled wood from a nearby remodel (with permission) and roofing material and other supplies we had on hand. The coop has a main area with roosting bars and then a laying area with a flip up lid for easy access to eggs. The coop is in a pen that we close a night and it is completely predator-proof. Our hens spend the day in a “play pen” that is adjacent to their coop area. It is fenced in but roomy and during the summer they are shaded by a satsuma plum tree. They also hide out under a huge rosemary bush. Our garden was on the Common Ground garden tour in 2011 and we grow lots of fruits and vegetables. 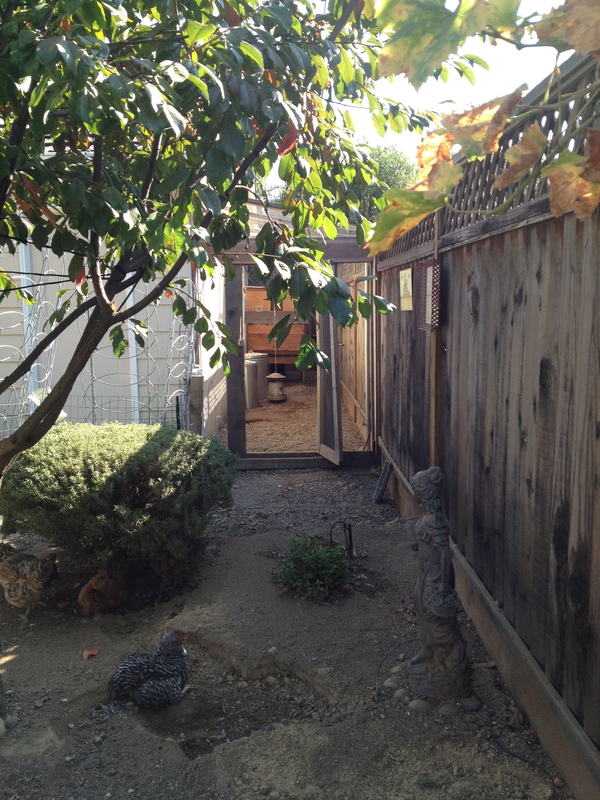 So folks can have a tour of the garden in addition to seeing the coop and our 3 hens. We will serve ice water with lemons from our tree.